Each ribbon hank measures 3 metres in length. Ribbons measure between 21mm & 50mm. An assortment of printed ribbon, woven ribbon, plain ribbon, wired ribbon and unwired ribbon. Please note: A 10% surcharge will NOT incur if you order under a quantity of 5 packs. Hank Packs - 100 random Ribbon hanks Each ribbon hank measures 3 metres in length. Ribbons measure between 21mm & 50mm. 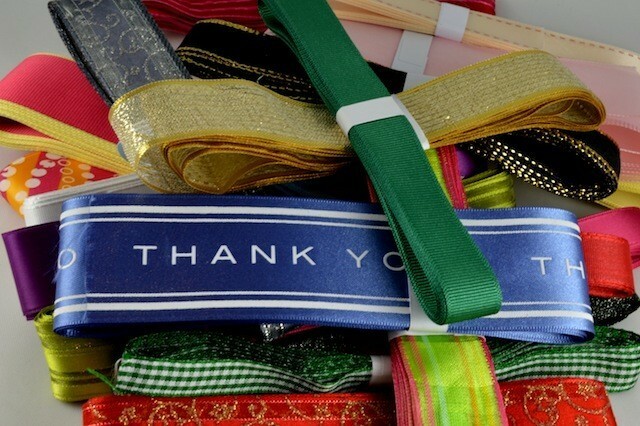 An assortment of printed ribbon, woven ribbon, plain ribbon, wired ribbon and unwired ribbon. Please note: A 10% surcharge will NOT incur if you order under a quantity of 5 packs.